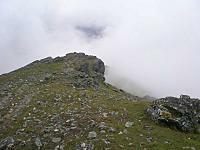 The summit of Ben More is a steep sided triangular pyramid with crags mainly restricted to its SE face. 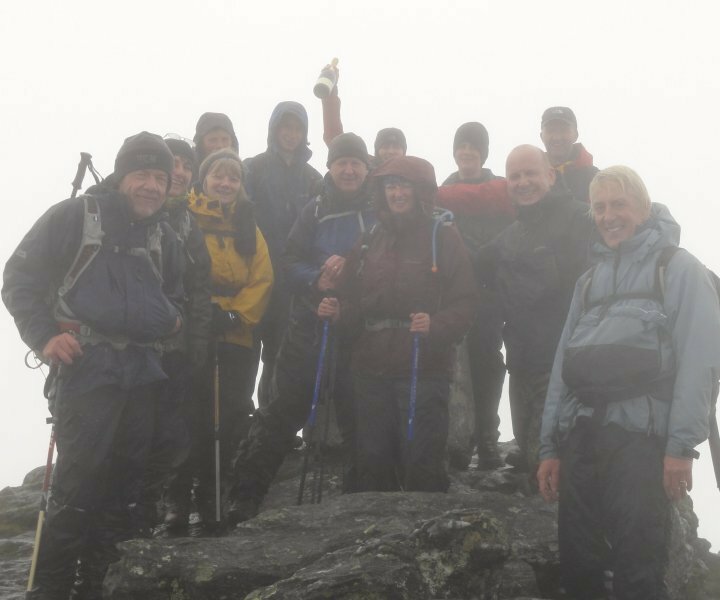 There are short steep ridges, NW to Benmore Farm offering an unrelenting route for masochists, and S to Bealach-eadar-dha Bheinn where Ben More meets Stob Binnein. 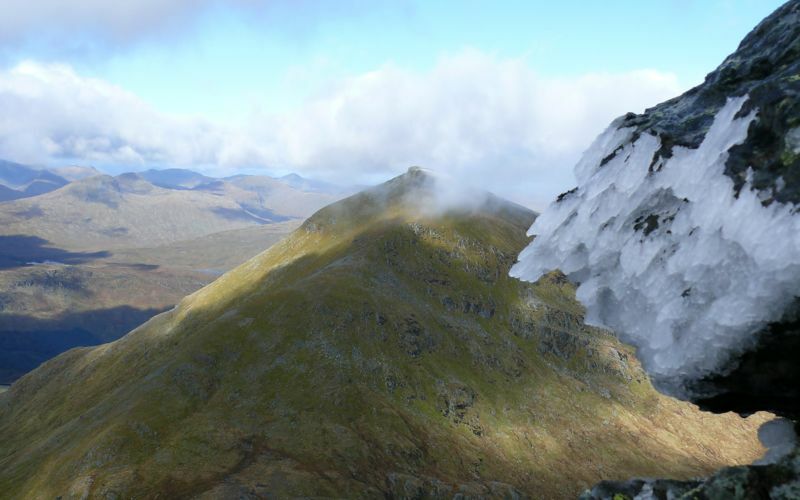 The S ridge offers access from both Stob Binnein and the path in Benmore Glen. A third ridge NE is the longest and craggiest, but is a good ascent route which can be accessed from the A85 via a path by the Allt Coire Chaorach through the forest . The summary information of one or more ascent routes that include Ben More [Crianlarich]. 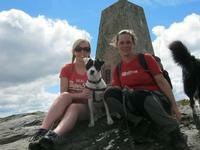 Me and Val at the summit on a beautiful, hot day! Resting at the top after a long climb on a hot day! 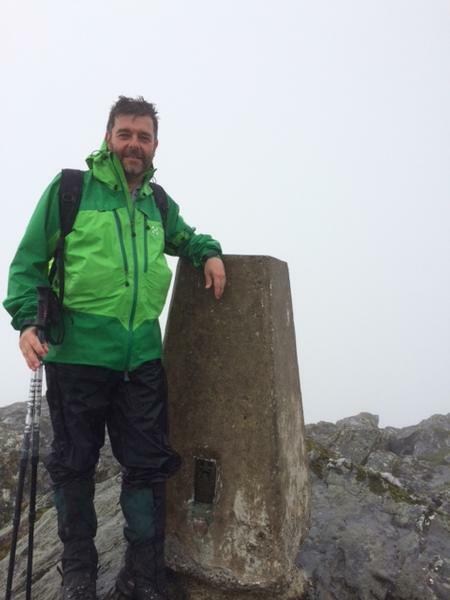 Post a few words about Ben More [Crianlarich] or read what others have had to say. Showing the most recent 5 of 23 comments. Would you like to view all 23? Heard so much about the Crianlarich North approach to Ben More and the relentless slog with no let up.Everything said is true.1174m of hard going.Started from the lay by across from Loch Lubhair just before Ben More Farm.Sign post points "To Ben More" Cross a high style and on to a land rover track which starts steeply and stays so until you reach a gate.Cross the burn here and head up steeply as usual along side the stream.Keep with this for about 1500ft and you run in to a well worn and rocky path.This takes you North west and on to a high shoulder.The next steep part comes in to view but only limited as the cloud was now down.There is a large corrie to your right which some folk were in.I did not fancy the look of that so upwards on the rocky path all the way to the top.Large Cairn first with a trig pillar just visible in the cloud a few yards ahead.Deep bolt hole below it, in there for a much needed drink. Downwards is a total knee basher. Be fit. Be ready if you do Ben More. Stob Binnein & Ben More are definitely best accessed (according to people we met at the summit who had slogged up from Ben More Farm) from Inverlochlarig. 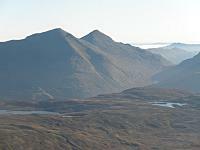 Whether or not to go straight for Stob Binnein then Ben More by the “direct route” is a matter of preference. The “indirect” route behind the farm by the track means that you walk through some pretty boggy ground to end up in the valley between the two mountains so you have to climb constantly to reach one summit, then down and back up like a skateboarder in a half pipe to access the next one, then back down again!! We did the direct route and found it to be a really nice day out, despite some pretty hard work at some sections, the exit via the track is really welcome after the hard work at higher level. Climbed from Benmore farm in Dec 2009. I can see why many people describe this as a slog (it's a uniformly steep, pathless, grassy hillside until you reach the path by the wall on the edge of the hanging corrie at ~750m). However we had plenty to distract us from the steepness, walking out of a cloud inversion at 300m, then another which formed at 1000m later in the day! Also had to negotiate frozen snowfields above 1000m, cutting steps for my mate who didn't have crampons. 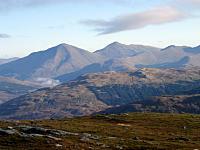 Stunning views from the top, Ben Lui and Ben Lawers peeking out above a sea of cloud. An unforgettable day.